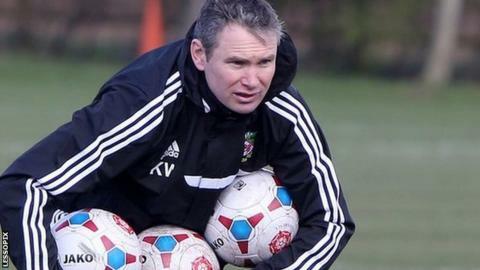 Kevin Wilkin is aware Wrexham need more strength in depth and hopes to add to his squad before the transfer window closes. Wilkin's side secured their second win of the Conference season with a 2-1 home victory over Nuneaton Town. The Wrexham manager says he will have to let players go out on loan before he can add to his squad. "If I can generate a bit of money to be able to bring somebody else in, that's what I'll be looking to do," he said. "We're going to look at trying to create some money by getting one or two out on loan this week. "There's one or two there, if I'm being honest, that probably won't feature at this stage." Midfielder Jonathan Royle has joined Conference North side Colwyn Bay, where he spent a spell on loan last season. Defender Blaine Hudson, winger Wes York and strikers Louis Moult and Connor Jennings joined during the close season. Wilkin added defender Manny Smith and goalkeeper Daniel Bachmann on the eve of the new season. Bachmann missed the win over Nuneaton after he was knocked unconscious in training while captain Dean Keates and striker Andy Bishop remain on the sidelines. Wrexham have won two of their opening three games and the win over Nuneaton came following a disappointing 3-0 home defeat to Gateshead. Next they face Alfreton Town away on Saturday. Former Nuneaton Town manager Wilkin, who succeeded Andy Morrell in March 2014, is happy with his side's progress. "It will take time for us to develop the side and the squad and that's something I won't stand still with and I need to continue to do," Wilkin said. "There's quite a lot of inexperience for a side that's expected to go on and challenge at the top end of the league. "Those boys have got to step up now and it's important we keep achieving results to make us a force to be reckoned with. "If we can get experienced players like Andy Bishop and Dean Keates in and around and available again, clearly that gives us the strength."